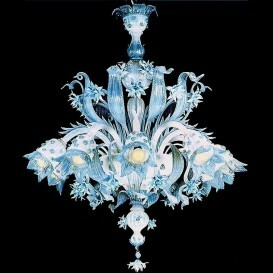 The style of the Venetian chandeliers is unique and unsurpassed. 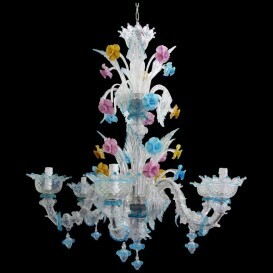 In these chandeliers will find the grace and beauty of Venice, the love for beautiful things and the harmony of the colors and shapes of the glass. 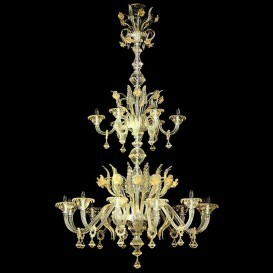 If you appreciate the beauty of Venice these chandeliers will make your home a royal palace. 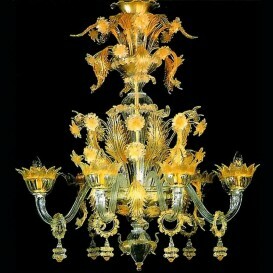 Venetian chandelier of the highest quality, made with elaborate techniques by Master glassmakers among the most famous. 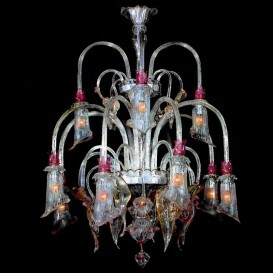 It provides an enchanting play of lights with an antique flavor. 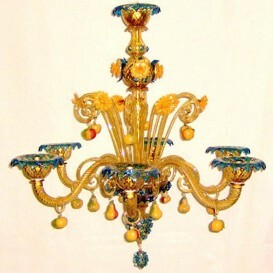 The pink, yellow and red in a chandelier 24k gold are the traditional colors of the glass for a Venetian chandelier. 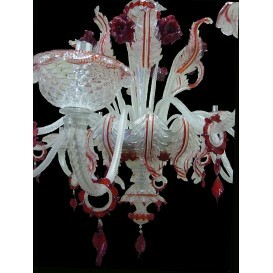 This Venetian glass chandelier is of fantastic quality with a fabulous design and a romantic look. It is truly one of the most exquisite Italian masterwork. The imagination of our Murano glass masters has no limits, apples and pears in this chandelier remind us of the beauty of nature. 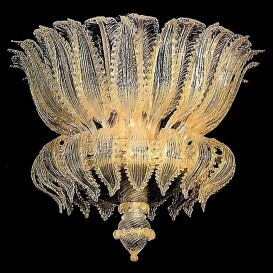 Even in Venice at the time of Serenissima Republic the Master glass created chandeliers in "modern" style like this. Quite an unique style mixed with the utmost quality. 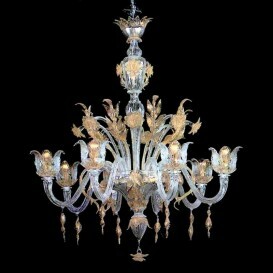 All the best features are in this magnificent Murano chandelier. Undoubtedly, one of the most renown Italian masterworks. 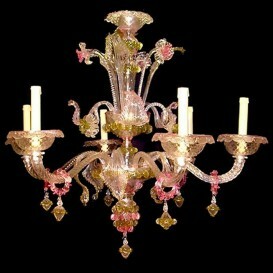 Who said that Venetian chandeliers aren't the best thing in the entire world? Because they were wrong. This one is the ideal gift. 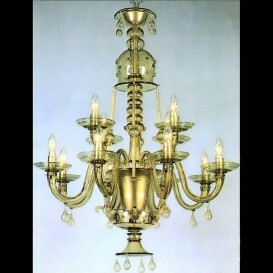 A classic Venetian chandelier in old style. All Murano red glass with 24K gold details. 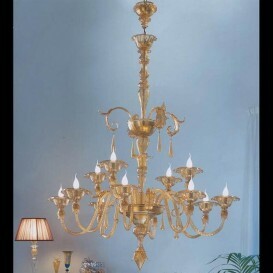 An amazing Venetian chandelier that provides your living room with an exceptionally imperial look. 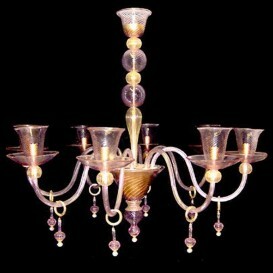 Its vibrant and exceptional style makes it a very special addition to your beautiful home. 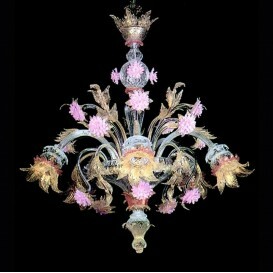 Some of the words that might describe this Murano chandelier are gorgeous, stunning, ravishing, breathtaking or attractive. However, nothing can describe it better than its look. 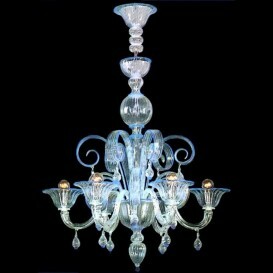 Sophisticated design, made with great skill, its shape round shape is characterized by many delicate details, a beautiful Venetian chandelier, a unique masterpiece of the art of Murano glass. 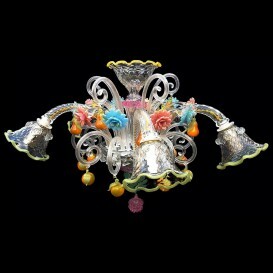 Also in this Murano glass chandelier our Masters have wished to remind the fruits of nature. Apples and pears bright to shine better in your home. Gentle curves and colors light but firm. 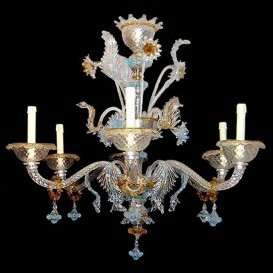 The shape of this chandelier in old Venetian style is very delicate with its large curved arms. There are just not enough words to describe this masterpiece. 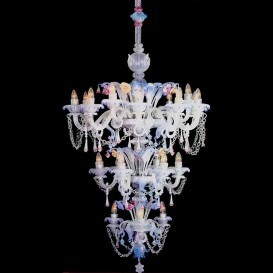 A genuine Murano glass chandelier which has been handcrafted by passionate artists with a high respect for the Murano tradition. 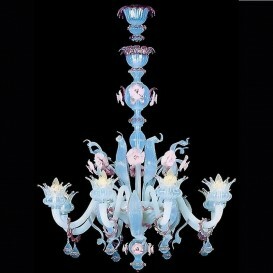 A very special interpretation of the chandeliers in Murano glass. This has particularly sumptuous arms and a silhouette very elegant, with details in the shape of flowers and fruits. 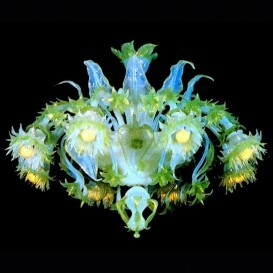 Women love flowers and they love them even more if they are part of a Venetian glass chandelier. 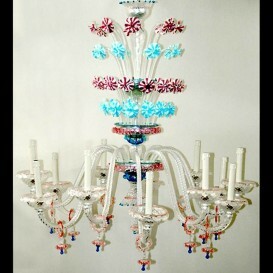 It's like all the best features were reserved for this particular chandelier. 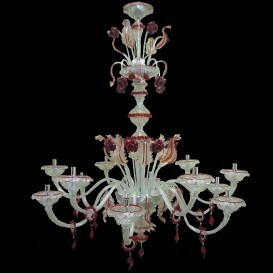 A stunning Murano chandelier with a floral design, large curves and slightly crisp lines. 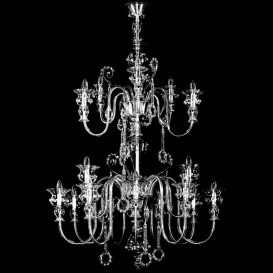 This is the chandelier that will be remembered by all your guests. 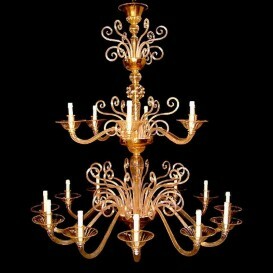 Twinkling transparency and real 24K gold in this Venetian chandelier in old style. 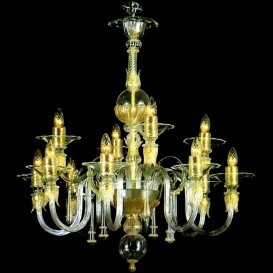 Elegant Murano glass masterpiece. 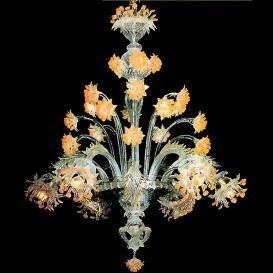 A more than splendid Venetian chandelier, a beauty. It combines ideal craftsmanship, high quality and original design. 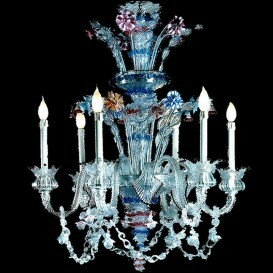 This is the chandelier that suits a house, a villa or a palace. 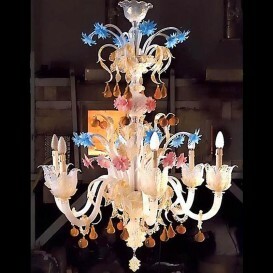 A fabulous masterpiece created only by the most talented artists that enjoy Murano glass and their passion is designing unique Murano chandeliers. 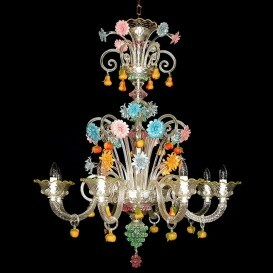 A lovely and prestigious Murano glass chandelier that is an innovative interpretation of baron style. A gorgeous item for your own living room. 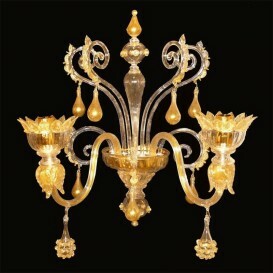 Elegant simple shapes and sinuous, in this Venetian chandelier we discover the ancient beauty of a Venetian home. 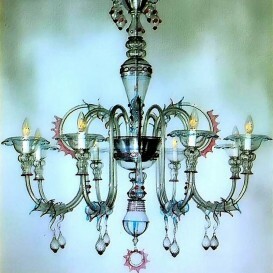 Simple and curved, the stylized forms make this chandelier unique, simple and beautiful at the same time. 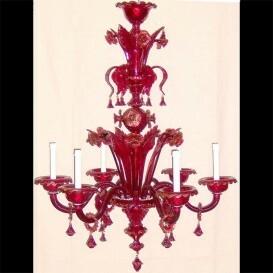 Who would've thought that a Murano glass chandelier will pass beyond imagination and it will reveal a whole new and gorgeous candle shape in such an extraordinary way? 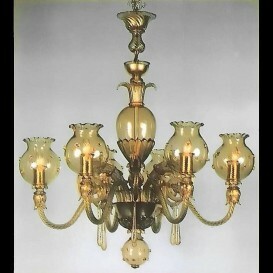 Stylish, yet with a classic look, this Murano chandelier is one of the most beautiful chandeliers. An outstanding design that provides a glimpse of royal courts. 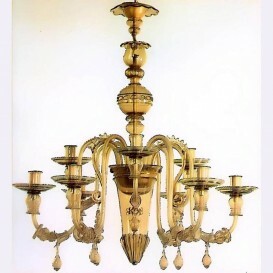 A classic Venetian chandelier in semi-Rezzonico style. 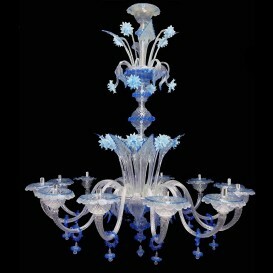 The details in aquamarine and the colorful the flowers enhance its beauty.